Star Wars is pretty awesome. The series has spawned some of pop culture's most enduring phrases and intriguing characters. Show your love of Star Wars in a sensible way (meaning not dressing up like Boba Fett every Thursday) with these officially licensed Star Wars USB Flash Drives. Each Star Wars USB Flash Drive features 8 GB of storage and an assortment of preloaded digital goodies. Current characters: R2-D2, C-3PO, Darth Vader, Boba Fett, Stormtrooper, Wicket (the lovable Ewok), and Han Solo with Carbonite carrying case. Collect them all! Dimensions (USB drive): 2.25" x 1.0" x 0.5"
Dimensions (carbonite carrying case): 1.75" x 2.625" x 1"
1:07 - Keychain cases are now sold separately and not included with each flash drive as indicated in the video. We're Star Wars fans, but we're not fanatics. We like the movies and think the characters are cool, but you probably won't find us at any one of the hundreds (yes, hundreds!) of Star Wars conventions held each year. So, despite our never-going-to-stand-in-line-for-eight-hours-to-watch-an-IMAX-version-of-Episode-2 status, we love these Star Wars USB Flash Drives. The designer 8GB USB flash drives feature officially-licensed, cartoonized versions of your favorite characters. A small light on the back of their feet lights up when connected to a computer. Each Star Wars USB Flash Drive comes preloaded with digital goodies (which you can delete from the drive if you don't want them). Every item is included in both PC and Mac formats. 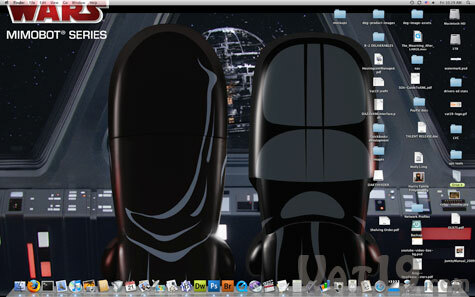 Wallpapers - Adorn your desktop with over a dozen Star Wars-themed wallpapers. They're included in a variety of screen sizes ranging from 800x600 up to 1680x1050. Over a dozen Star Wars desktop wallpapers are included on every flash drive. Avatars - Need a new avatar for MyTwitterFace or that I'm-secretly-a-huge-Star-Wars-fan forum? There are twenty to choose from. A variety of Star Wars avatars are pre-loaded on each flash drive. Icons - The same set of avatars are also included in a larger format to be used as icons for folders, hard drives, and yes, of course, your new Star Wars USB Flash Drive! Screensaver - Remember the days when people flaunted their screensavers as if they were the ultimate status symbol? Flying Toasters, anyone? Kick it old school on your PC or Mac with a Star Wars-inspired screensaver. 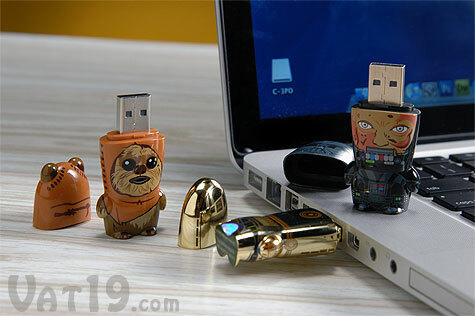 Audio- Each Star Wars USB flash drive pictured below includes a small piece of software that allows it to play a short sound clip when the drive is inserted or ejected from the computer. You just never know when you're going to need to transfer some pictures, videos, or grab your friend's stellar collection of Kelly Clarkson desktop wallpapers. That's why the optional keychain hoodie is so handy. Clip it onto your keychain and you'll always have 8GB of super-fast USB 2.0 storage at your fingertips. Please note that the keychain hoodies are now only available in black. Keep your 8GB Star Wars USB Flash Drives at-the-ready with the optional keychain hoodies. 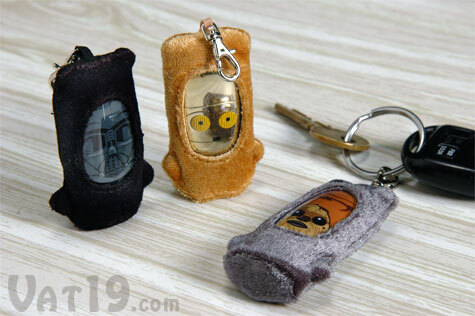 Our current line of Star Wars Mimobot USB Flash drives includes the following characters: C-3PO, Darth Vader, R2-D2, Wicket (the Ewok), Boba Fett, Stormtrooper (you'll randomly receive either Luke or Han Solo), and Han Solo with Carbonite Carrying Case. 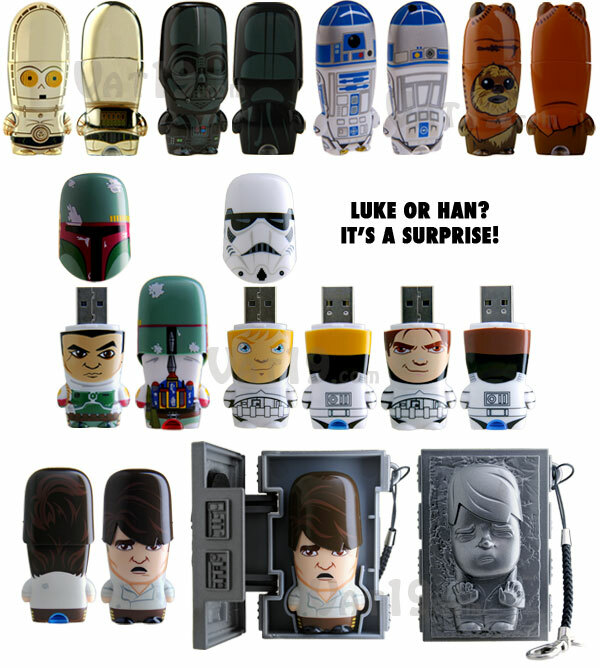 Collect all of the Star Wars USB Flash Drives! Question: Will this Star Wars USB Flash Drive work on my computer? Answer: Yes. If your computer has USB ports, you're good to go. If you have USB 2.0 ports, it will run even faster. However, it is still compatible with any USB port. Question: What if I don't want the digital goodies that come with the drive? Answer: You can easily delete those files if you don't want them. Question: Does it come with a carrying case? Answer: Only Han Solo comes with a carrying case. In his case, it's Carbonite! Otherwise, the Keychain Case must be ordered separately. Question: How do I request a particular style of Stormtrooper? Answer: Sorry, but that's not possible. We don't even know if it's Luke or Han pulling off the Stormtrooper masquerade. It's essentially a toss-up as to which one you'll get. Hey, that's half the fun! Question: Are you guys going to be at the next Star Wars Fan Days? Maybe we could hang. Answer: We love Star Wars. We're just not in love with Star Wars. Cool?